Scissor-Switch Keys: ALBA is specially manufactured for 10,000,000 keystrokes per key. Dedicated Apple® keyboard: With a built-in chip made specifically for macOS®, the new ALBA shortcut keyboard is pure plug & play. No need for drivers and tedious setup. Built-in macOS® chip: ALBA’s special chip makes it fully compatible with macOS®. Easy to set up: We’re big believers in plug & play, which is why we went to great lengths to build a chip that ensures easy keyboard setup. 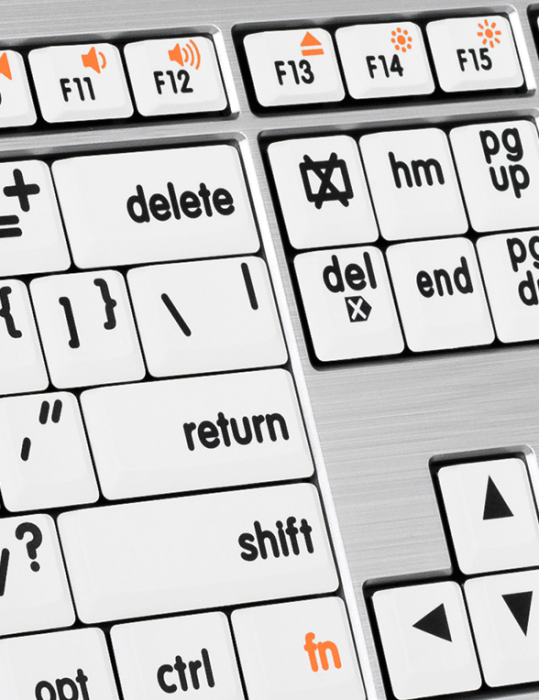 All you could want from a Large Print keyboard: What makes the perfect Large Print keyboard? A wired Large Print keyboard and two USB 2.0 ports, that’s what. 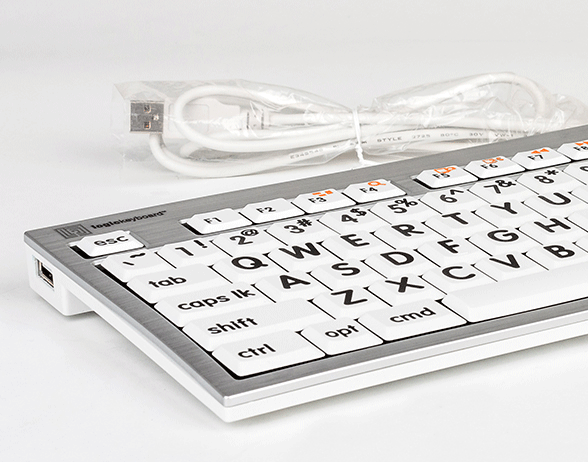 Wired keyboard: Few wants to rely on a battery-powered keyboard. So our ALBA Large Print keyboard is wired, of course! 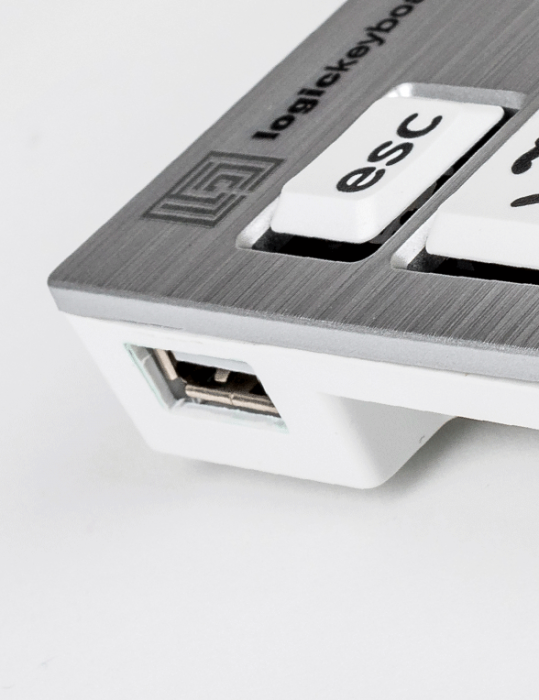 Two built-in USB ports: One USB on each side of the keyboard = convenient for connecting your external hard drives or wired mouse. 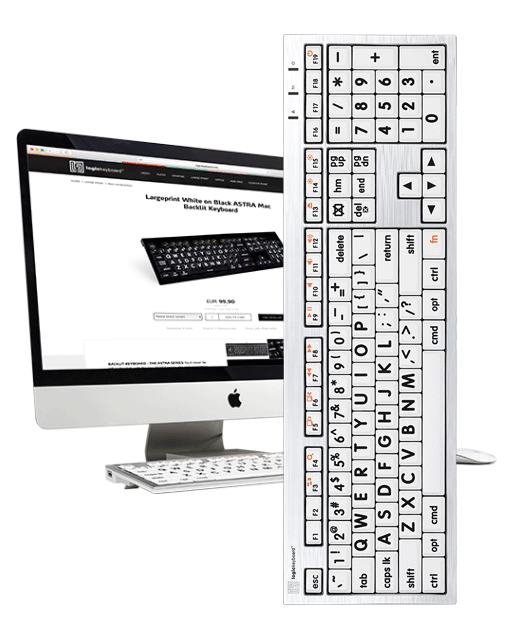 A Mac® Large Print keyboard that’s simply awesome: Our new Large Print keyboard for Mac® isn’t just beautiful – it’s also extremely durable, and therefore ideal for endless hours of typing. On-point ergonomics: We partnered with an ergonomic therapist to determine ALBA’s optimum angle. The solution: a typing angle of 8.5 degrees with leg lift, and 4.5 degrees without leg lift. Key travel: Key travel can't be too big or too small, so our new ALBA keyboard has what we believe is the perfect key travel: 4mm. Plug & play: Installing drivers and wasting time on keyboard setup? That’s so 90's. 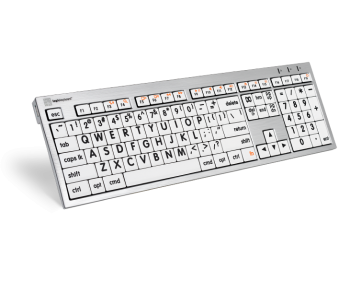 Our ALBA Large Print keyboard is plug & play. Pure 21st-century. Three LED indicators: Three LED indicators: caps lock, FN lock, and power.